You may have noticed a new daily video show on Bleacher Report called “Have Clips Will Tailgate.” B/R’s various cool guys tailgate “almost live” from different locations, including, uh, in the middle of New York Harbor, introducing clips centered around the day’s theme. What’s happening here is that Bleacher Report is using YouTube’s playlist functionality to create a new format for a video series—combining curated selections from the vast library of sports footage on YouTube with the unique and entertaining analysis that only Bleacher Report is known for. 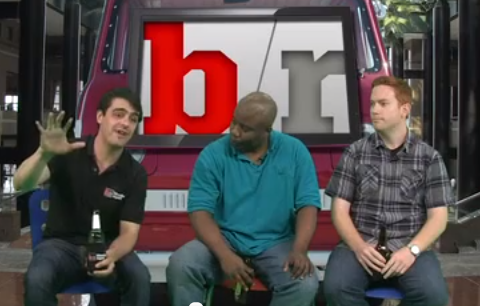 You can find the shows on Bleacher Report’s YouTube channel or on Bleacher Report here. Some of my recent favorites are Top 5 Punishing NHL Hits and 5 Best MLS Goals From Outside the Box. I also enjoy watching my co-workers drink beer on the clock. Not that I can’t see that live. We’d love your feedback. We’re still working on perfecting the format of the show and figuring out the best way to use the playlists to tell a great story. And we’d love your suggestions about the best sports clips on YouTube to feature. If you have suggestions or feedback, leave them in the comments here, or in the Bleacher Report comments on one of the shows. Might be cool to include some of the top writers from the various sports/teams from time to time.